When you do the first attempt you get 10 Diamonds registered in Hot Events and obviously receive the 2m reward, however continuing to do Alchemy won\'t register the amount you are spending; but rather the amount of times you try again. Any attempts past the first 10 diamond cost, still only register as you having spent 10 diamonds each time even though you spend 20 diamond the second time; so on. Let me know if this didn\'t make sense I will try to edit to be more logical, but it\'s pretty simple really. 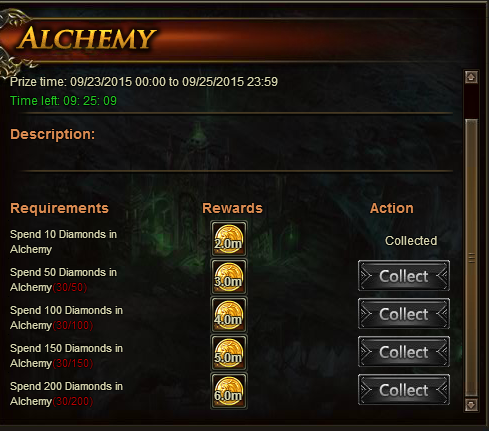 No matter how many diamonds it is costing you to use Alchemy, it still only registers as 10 diamonds per attempt in Hot Events. I have been very agitated about this having wasted diamonds figuring it out, I would like to see this fixed soon. Okay thank you I guess, I still think that\'s a bit ridiculous. Should be the total amount of diamonds you spend, not how many you spend in one attempt. That\'s pretty lame. Exactly, if anything make it more clear so you understand Spend 50 Diamonds at once in Alchemy or something along those lines. Would be less confusing and irritating for those of us that end up spending diamonds for nothing. 2019-4-23 00:51 GMT+8 , Processed in 0.053685 second(s), 44 queries .